Have a look at The Power of Raindrops: A film about recent EMU led work in Namibia. Click here for Managing Outback Tracks by Hugh Pringle and Mez Clunies-Ross. 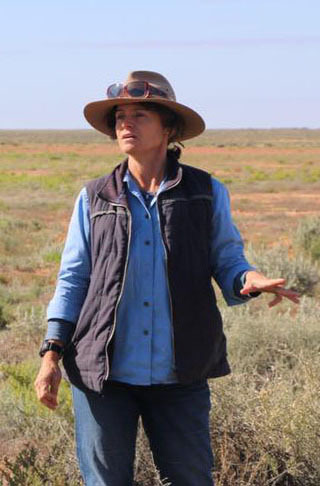 A Rangeland Rehydration publication by Rangelands NRM (Western Australia). Photo: Ken Tinley: Taken in the arid Gascoyne area of Western Australia, the photo above shows that as long as the drainage is not 'unplugged' wetland habitats can thrive even in very low rainfall areas. Photo: Janine Tinley: A healthy billabong on the brink of being 'unplugged' by an encroaching gully head. EMUTM(Ecosystem Management Understanding) is a land management program for pastoralists and other land users to re-cover their land and enhance productivity. EMU introduces land users to the ecological management of landscapes and habitats by learning to recognize and read landscape processes, condition and trend, and to capture rainwater onsite. EMU workshops are held on pastoral stations/ranches or rural land-use areas where participants attend voluntarily and are led by trained EMU facilitators. Land productivity is fundamentally based on keeping rainwater in the soil and land management is optimally based on drainage units. The EMU program brings together communities who share the same catchment areas. Participants initially record their knowledge of their own land in an overlay mapping exercise. This is followed by an aerial overview and then ground traverses of the key areas and issues identified by the mapping process. During the workshops knowledge is shared between participants and their facilitators with resultant reciprocal learning. A goal of EMU is to build socio-ecological resilience in land users through the use of their knowledge of their land, their capacity to adapt, and their willingness to work with the natural processes towards recovery of habitats and biodiversity. The program’s ultimate success occurs when pastoralists/managers rarely require extension help and instead help guide other managers in mapping their knowledge and learning how to recognize and interpret the signs of their land for recovery and maintenance purposes towards attaining a viable Triple Bottom Line. Currently groups of graziers, tribal communities, game farmers and wildlife managers in Australia, Namibia, Ethiopia and Tajikistan have participated in workshops using the EMU approach. EMU is about wetland reclamation, recovery of habitat diversity and function, climate change adaptation, sacred site planning, landscape-smart grazing strategies, and landscape-scale permaculture. EMU is about recovering natural processes of drainage, habitat patterns and the working nuts and bolts of the living land. EMU provides ecological best-fit recovery and maintenance solutions particular to place and trend. 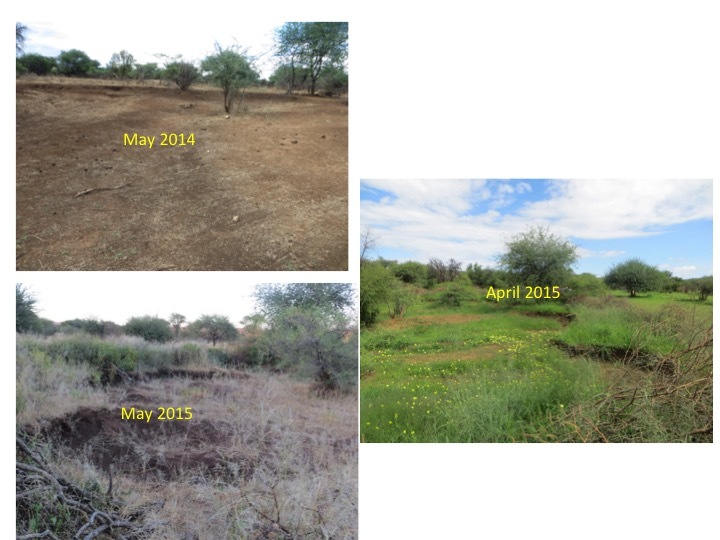 Before and after: EMU-led restoration of grassland in Namibia.